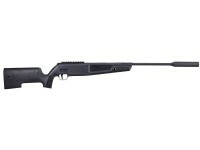 SIG Sauer breaks into the breakbarrel airgun market with the US made ASP20 Break Barrel Rifle, a suppressed single-shot, gas piston rifle ideal for backyard target shooting and taking down small game. 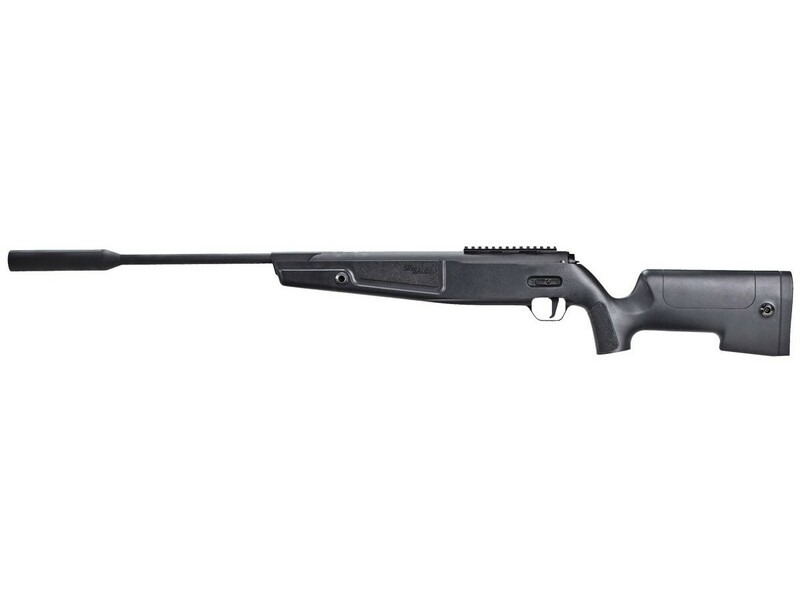 Available in .177 and .22 the ASP20 uses a gas piston powerplant that is specially calibrated to deliver its pellets downrange at optimal speeds for accuracy and energy. The added benefit of this powerplant is the ability to shoot in colder weather without sacrificing power as you would with a spring-piston. Each uses a Glidelite Cocking Mechanism to ensure that your cocking effort is a smooth and manageable 33 lbs. In the .177 caliber, the ASP20 slings pellets at 1021 fps, and at 841 fps in .22 to dump 20 to 23 FPE into your targets. This design is based on the notion that subsonic pellets will fire more accurately, a maxim that proves true time and time again among premium airguns. Built for quiet backyard shooting, those powerful shots are all moderated by an integrated suppressor. Moving to the action, the ASP20 features an adjustable 2-stage Matchlite® Trigger, designed for smooth and consistent trigger pulls to aid in accurate shot placement. A proprietary drill-pinned Breach Wedge Lock System also aids in improved accuracy by perfectly lining up the action with the barrel. A long Weaver/Picatinny rail awaits your choice of optics, and all of these features are set into an ergonomic black synthetic stock with checkering on the grip and forend. All of these options culminate in a superior gas-piston breakbarrel air rifle that lives up to SIG’s legacy of crafting airguns with innovative technology and quality construction that deliver hours of shooting fun. Things I liked: Very accurate, smooth, light trigger, Not that loud, very well packaged for safe delivery and best of all MADE IN AMERICA with SIG constructed barrel. Things I would have changed: With my inexperience you would be ill advised to consider any changes I may suggest, But as of right now I can't think of anything I would change. What others should know: Pyramid air and specifically Ruth in customer service were a pleasure to work with. I ordered a Diana 340 Ntec in August 2018 and as of January 2019 I still hadn't received it ( Dianas fault, not Pyramid air). I asked Ruth to suggest a comparable replacement and she suggested this SIG. Boy am I glad she did. Shooting JSB exact jumbo Diabolo 15.89 My first three shots ,before I even adjusted the scope ,out of this rifle at 20 yds were touching each other in a 1/2" group 1" from the center of the target at 11 o'clock. My next three shots were at 30 yds with a 3/4" group ( 2 touching each other) about 1 1/2" from center at 11 o'clock. Not bad for the first 6 shots out of this rifle from an inexperienced air rifle shooter. I'm anxious to find out how far this rifle will shoot accurately. Excusing inexperience and a short range time, right now I can't say enough good things about this rifle. Someone with more experience could give a better more technical review than I can. I believe the synthetic version of this rifle is not yet available. My review was intended for the Beech stocked version . But I don't think it would have changed this review ! When will these be available in synthetic? Is there any idea of when the scoped rifle will be available? I don't understand why there is no information. I'm like a kid at Christmas. I'm anxious. Last I heard, the scope was the hold up. Probably not until 2019 on the combo. PA does plan to sell it though when there is a firm ETA for it. I placed an order for the asp20 not realizing it has no iron sights. 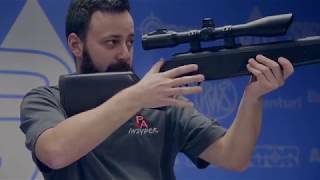 Will the scope be available mid nov when the rifle starts to ship? From what I have heard, the scoped version (scope itself too I think) Will not be available at the same time as the rifles.